I’m not sure where this month went. I mean, obviously that’s how we all feel at the end of every month. But there’s this thing with four-month-old babies where they suddenly need to re-learn how to sleep. So they sleep like newborns again – or worse, in the case of mine – except you’re back at work and nobody’s offering to bring you casseroles anymore. Parents: feel free to either give me the knowing sympathetic look or tell me how much worse it’ll get. Those who want to tell stories about how their kid always slept great can go find somebody else’s comment section. So I literally don’t know where the month went. It’s all pretty hazy. But I did do one new thing this month: I guest lectured for a Middle Eastern Studies class. The professor asked our department chair if one of us could put something together on Middle Eastern mathematics, and due to retirements and sabbaticals I’m apparently the person on campus who knows the most about the subject. I was on the fence about accepting. It’s not like I’m low on service to the college. And I’ve been working on saying no to things with no substantive payoff. But I either wanted a change of pace or was feeling generous. 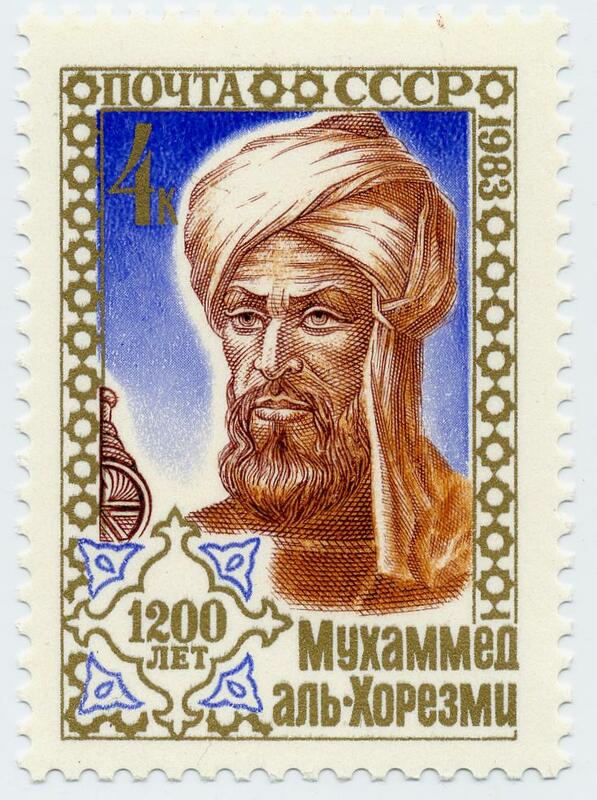 I spoke mostly about Muḥammad ibn Musa al-Khwarizmi, the man whose name gave us “algorithm,” and whose work gave us algebra – both the word and the concept. His most famous work, Hisab al-jabr w’al-muqabala, sometimes translated as The Calculation of Reduction and Completion, describes the state-of-the-art mathematical techniques of the time. So “algebra” was the latinization of “al-jabr,” meaning reduction (in the sense of reducing a fracture), which al-Khwarizmi used to refer to adding a number to both sides of an equation. If you can fight your way through that, you’ll see that it’s basically just a very specialized version of the quadratic formula. And what’s more, Al-Khwarizmi even offers a proof, and a geometric one at that, because of course that was how you proved stuff in 840AD. In that proof, he builds a rectangle that’s x units by 10+x units, and also 39 square units. And then he moves some pieces around and literally completes the square to find x. How cool is that? Seriously, page through this thing if you have a minute. So in my guest class, I lead a handful of humanities students through all that. And they didn’t hate it. I’m not saying this was the highlight of their week, but they liked seeing the preliminary stages of the development of something we take for granted. And I got something out of it after all, because the class had been reading a book I’ve just picked up from the library: The House of Wisdom by Jim Al-Khalili, about how Arabic science did more than just shine a heat lamp on the works of the Greeks until Europe was ready to pick them back up again. I’ll let you know how it is. Right after I get some sleep. 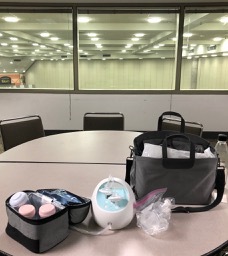 Here was my view for a good chunk of the Joint Mathematics Meetings, where I was holed up for the third time that day in the lactation room. My then-two-month-old baby was an hour away at home, so if I wanted to keep nursing, I had to pump. Every three hours. All day. My sincerest thanks to the organizers, because I have never been so appreciative of a conference amenity. Not even the free coffee on the exhibition floor comes close. Matilde Lalin wrote a nice writeup on Terry Tao’s blog of the options for a nursing mother at a conference. You can bring your kid along, or you can pump. Luckily I live close by, and my husband and in-laws can provide child care, so I didn’t have to try to drag a fussy infant around the giant Petri dish of a conference. And the organizers provided this pretty great little room. There’s a water cooler, and a bathroom, and outlets…and a skybox-style view of the employment center. But it was hard to be stuck to a rigorous break schedule. I pump roughly every three hours. Pushing that is at best uncomfortable, and at worst can drop my milk supply or cause health complications. Start to finish it takes somewhere between 15 and 25 minutes for me. So that means missing part of a session, or missing breaks. Matilde points out that missing the sessions is sometimes preferable, since if you try to pump right at the start of lunch, by the time you’re done everyone’s gone, and you’ll miss out on important opportunities to meet people and talk math. I also find it important that these resources be listed publicly in the institute/conference website. This serves a double purpose: first, it helps those in need of the resources to access them easily, and second, it contributes to make these accommodations normal, setting a good model for future events, and inspiring organizers of future events. I’m so thankful for the decades of parents who’ve navigated and normalized these issues already, but there’s a ways to go. Now I’m pumping at work too. In a way it’s nice – I’ve got an excuse to paper over the window in my office door and shut myself away a few times a day. Mostly it’s a hassle that I still can’t seem to remember to build into my day. I keep forgetting a part or my cooler at home, or forgetting to schedule breaks in between meetings and classes. And I’m lucky enough to have an office to myself, with a sink nearby. If I were in a shared office and had to go to the official lactation room across campus, I’d be having a much rougher semester. Of course, these problems could all be solved for me. Formula exists. And it’s great! We use it! But I wanted to nurse if I could make it work. And I am, though it makes my workday more complicated. But conference organizers, school administrators, hiring committees, departments, and faculty need to be aware of these extra challenges for their nursing colleagues and students when designing schedules and assigning responsibilities. Our internal summer research grants were due yesterday, and for the first time I tried to apply for one doesn’t involve students. A few years ago I received our internal grant for summer research with students, which went well. But I should really get a few more actual “grownup” projects done before I go up for tenure, and the money and cv line this grant will bring won’t hurt. So I went for it. But this was one of the hardest grant proposals I’ve ever tried to write. Less than two pages describing your project and its relevance to the college, the community, “or beyond.” This is a small college. I know the committee. The person on there who’s the least math-phobic is a historian. This is the most general of general audiences. If I start with “Let R be a Noetherian ring” I’m dead in the water. Even if I had the space to define all the necessary vocab, almost no one on the committee would bother to try to parse it. I can hardly blame them: they’ve got the same heavy teaching load I do, and they’ve got a ton of these things to read. This wasn’t so hard with my undergraduate project a few years back, because I’d chosen a topic that had to be digestible by undergraduates, first-years at that. It was easy to state – a nice little semigroup problem, with pictures and everything. Even then I got comments from a committee member that it they couldn’t follow my description. They’d more or less just taken it on faith that I knew what I was talking about, and since I was a brand new faculty member they figured it would be nice to throw me a bone. I’m not sure I’ll get that kind of consideration this time. So what do you do? This isn’t rhetorical. I’m really asking. People always say that if you can’t explain something simply you don’t understand it well enough. Am I alone in hating that quote? I decided that my goal for this proposal was not so much to get across the exact nature of my project, but to make the committee feel like they had some idea of what was going on. This word has some negative connotations but I’m gonna go ahead and use it anyway because it’s just so useful: I needed to get across the truthiness of my project. I at least presented a toy example that lives in the integers, though I’m afraid that will either still turn the committee off, or worse convince them that this is a totally trivial project. Then I argued by analogy: I have a space of objects and an algorithm to provide information about those objects, but it’s like I only have turn-by-turn directions to navigate this space. I can’t see the underlying street map yet. And then I talked about how I’ll use techniques to gain access to this map (techniques I named but didn’t describe) that are well established but haven’t been used in this case yet. Which should demonstrate in understandable terms that this project is probably not total garbage. And then I mumbled something about applications to other problems, and other areas of math (which I suspect the committee doesn’t really care about), and…cryptography? Maybe? They’ve at least heard of cryptography. Who knows if it’ll work. Maybe I have enough clout banked with enough of the committee that they’ll fund me even if they weren’t wowed by the proposal. Maybe they just won’t get many applications this year and I’ll skate through. I will ask the committee for feedback when it’s all over though, and present to you what they said. In the meantime, what advice do you have for people in a similar situation?